The Huskies nearly beat the Tar Heels in the 2011 NCAA tourney. If the 11.5-point underdogs pull it off Sunday, be sure to keep a safe distance from UW coach Mike Hopkins. COLUMBUS, Ohio — As someone who freely admits he’s “49 going on 14,” Mike Hopkins at the moment is all Disneyland, horse rides and slip-n-slide. In his second year as a college basketball head coach after a two-decade apprenticeship, his giddy meter has pinned the needle. Blue blood, meet purple passion. Huskies fans might feel differently, wishing their team in the second round (11:45 a.m. Sunday, CBS) had drawn a less formidable opponent than the Tar Heels (28-6), the No. 1 seed in the Midwest Region with all the prestige, pomp and presence of 18th-century British royalty. But Hopkins, having been a player and coach at Syracuse when the Big East Conference was at the vortex of college basketball, radiates in this culture. “March Madness is an opportunity for Cinderella — having a chance to play for a national championship,” he said. “We didn’t come here to just get here. That’s not our standard. To the unwashed in Las Vegas and others with a financial stake in the outcome, it looks like the ninth-seeded Huskies are 11.5-point underdogs to an outfit that plays the game at another level. To Hopkins, it smells like teen spirit. If enthusiasm were the primary definer of tourney success, the Tar Heels would stand little chance. But it’s almost always about talent, so much so that North Carolina looked to be believing its own hype Friday night when they trailed at halftime 38-33 to 16th-seeded Iona, yet had no problem finding the accelerator in the second half for the inevitable blowout. 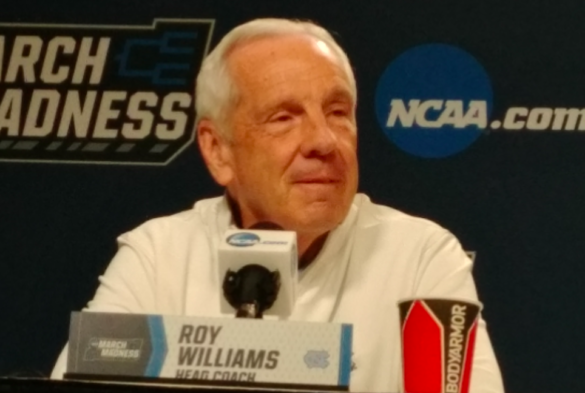 Venerable coach Roy Williams was not amused. Since it’s not always about talent — recall last year that Maryland-Baltimore County beat No. 1 Virginia 74-54, the first win by a 16th seed in tourney history — the notion of upset hangs in the air over this sports championship as no other. Part of it is that the 68 entrants are given a ranking by a committee of bureaucrats. By definition, it rankles the lower seeds to no end, because they have already won titles or have top-tier wins, yet enter diminished. Additionally, the Huskies, as regular-season champions of the denigrated Pac-12, feel the disparagement here in Big 10 country and the hometown of the Ohio State athletics colossus. That is something to which Williams can testify. In the second round of the 2011 tourney, the Huskies met the Tar Heels virtually on their home court in Charlotte. In one of the most agonizing outcomes in UW hoops history, the seventh-seeded Huskies (24-11) controlled the game for the first 36 minutes, but a series of late-game mishaps helped thwart the upset. No. 2-seeded Carolina (25-7) prevailed, 86-83, and from there Washington began a six-year backslide. Asked about the game, Williams had an acute recall of a foe led by Isaiah Thomas and Terrence Ross, both of whom have gone on to long NBA careers. Huskies fans would agree. Trailing by the final score with 1.1 seconds left, Thomas launched a potential game-tying three from the corner. It looked to be short, but Carolina’s John Henson leaped to grab it at the rim, provoking the Huskies to scream for basket interference. They didn’t get the call. Williams recovered from the near-coronary, and the Tar Heels continue to flourish. Entering the season, North Carolina had the third-most wins in NCAA history with 2,232, trailing Kentucky and Kansas. They are third on the list of NCAA championships with six, trailing UCLA (11) and Kentucky (eight). In his 15 years at Chapel Hill, Williams has three titles (2004-05, 2008-09, 2016-17). This year, another stellar team with three senior starters leads the nation in rebound average — the Huskies’ biggest weakness, mostly because of the zone defense — and has won 16 of its past 18 games. The only losses were to No. 4-ranked Virginia 69-61 and No. 5 ranked Duke 74-73 in the Atlantic Coast Conference tourney title game. Not coincidentally, all three ACC teams drew No. 1 seeds. The Pac-12 barely had three teams in the tournament, none seeded higher than Washington at No. 9. Much as Williams might despise it, the Tar Heels are the cool kids. As they are at every NCAA tournament. If they stay as cool as they were in the first half against Iona, the Huskies might experience what it feels, smells and looks like to create a slice of college hoops history. If it happens, be sure to stay a minimum safe distance from Hopkins. There’s a real chance this could be fun. All things considered, especially in context of how bad things were season before last, things are good. Athletic director, for extending Hopkins and locking Petersen up: A. Doing things “the right way”: A.
Today’s game was mildly disappointing, but nobody up here really expected anything radically different than the actual outcome. Now, to crack into the elite group, much work remains, but I like the ascension of the whole operation, much like Coach Petersen’s program. Last, if you want to compete with NC, Duke, Syracuse, Michigan State, Villanova (sometimes), et al, at this time o’ the year, you must have great depth along with everything else. Things are going the right way in all respects. Great reporting Art. Love the historical tie in. Remember that game well in 2011. Would have been a great win for Romar. UNC’s second half against Iona however was text book basketball. If UNC plays that way tomorrow it will be tough for the Huskies to keep up. Still, watching an energized Dickerson against Utah State and hopefully an attitude by the team that they have nothing to lose and therefore play with confidence, they can pull it off. The storylines here are fun. Hopkins has always been his own man, but a win over Roy will make it known to the college hoops world. Yes, garner a little respect, and perhaps then the broadcast teams would quit referring to the Dawgs as “Washington State” (I’m assuming it’s a differentiation from DC, not Cougs). For the Huskies to have anything resembling a decent chance in this game they have to control the pace. North Carolina turned their match up against Syracuse (which of course is most like UW) into a track meet. To avoid that, UW should use a token, soft 2-3 full court zone press that falls back into their regular 2-3 half court zone. There would be little confusion for the players since the principles are nearly identical. It would be extremely interesting to hear what, if anything, Boeheim suggested to Hopkins in his scouting report. Hopkins here in Columbus said Boeheim hasn’t been in touch because he’s coaching his own team in the tourney. The problem with the zone press is that Carolina is as fast as it is big. My guess is the risk isn’t worth the reward. I thought after the loss by Syracuse against Baylor, that Boeheim might have been in touch. It would be a little strange that someone who you worked with for 20 years, that employs the same strategy, and undoubtedly shares the same coaching verbage would not be in touch. Unless the Hopkins’ departure from Syracuse was not as friendly as we have been lead to believe publicly? As for the soft 2-3 full court zone, I was talking about a token zone done mainly for effect (not trapping or going for steals). Just looking to slow down Carolina and get the pace to Washington’s liking.